The award winning Terrace Restaurant at The Westin Dragonara Resort shall be launching the famous Sunday Lunch Buffet on Sunday, 5th October 2014 with a truly delicious and vast spread, featuring dishes from around the world. The Resort`s culinary team will ensure a lavish international buffet which will satisfy even the most discerning taste bud. 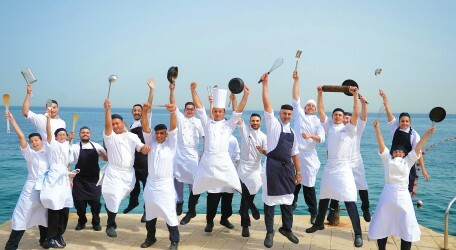 Featuring eight different stations, including a vast selection of over 70 items like antipasti, tapas or cheese, 23 main course dishes ranging from different types of seafood, to different pasta creations to local Maltese delights, guests will also find what is probably Malta’s largest selection of 35 delicious home-made desserts – a sweet conclusion to the Sunday Lunch Buffet making it a truly culinary feast. Every Sunday guests can indulge in this variety of local and international delicacies for just €34.95 per person, which includes half a bottle of wine as well as free parking. Children aged 11 to 15 years pay half price while children under 10 eat for free. A specially created Kids a’ la carte menu featuring both all-time favourites and a selection of healthy and kids’ baby meals is also available. The Terrace Restaurant is known for its delightful international and Mediterranean cuisine, created by Executive Chef James Mifsud and his team. Besides offering a wide choice of fresh, local and international products, this family restaurant also offers patrons an elegant setting as well as exceptional sea views. Whether guests are savouring their meal in the classic dining room setting or are refreshed by the gentle Mediterranean breezes in the al fresco patio – a great dining experience is ensured. Free parking and use of Westin Kids Club is included for all patrons.